Chloe & Halle Photos, News, and Videos | Just Jared Jr.
Dove Cameron & Tommy Dorfman Party at Coachella's 'V House'! Dove Cameron and Tommy Dorfman are getting in some sun while they party the day away! 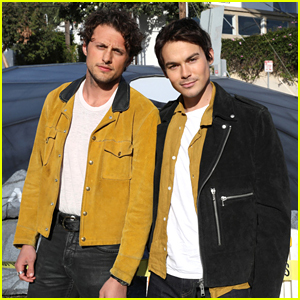 The 22-year-old actress and the 25-year-old actor were both at V Magazine, Instagram and Sunset Studio’s V House over the weekend at Coachella in Indio, Calif.
Luka Sabbat, Chloe & Halle, SZA, Sami Miro, Daniel Marley, Zuri Marley, Alisha Boe, The Misshapes, Juana Burga, Moses Sumney, Lizzo, Tommy Genesis, Ross Lynch, Jaime Chung, Larsen Thompson, Kerwin Frost,Alana O’Herlihy and Kiersey Clemons were all in attendance. We can’t get over Jenna Ortega‘s amazing look at the premiere of Star Wars: The Last Jedi! The 15-year-old actress hit the red carpet in a stunning black and white gown at The Shrine Auditorium on Saturday (December 9) in Los Angeles. 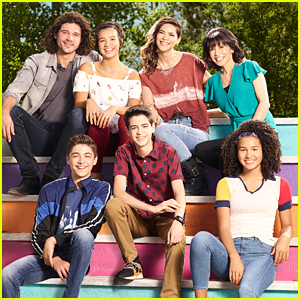 She was joined at the event by fellow Disney Channel stars Karan Brar, Booboo Stewart and Milo Manheim. Other attendees included Noah Centineo, Mason Cook and Chloe & Halle. “@starwars was amazing!” Jenna wrote on her Instagram after watching the movie. FYI: Jenna is wearing a Gosia Baczynska gown, an ear cuff, earrings, and a ring by Stefere, a ring by House of Emmanuele, and carrying a Kilian clutch. Chloe & Halle are wearing Louis Vuitton. Karan is wearing Florsheim boots. Yara Shahidi & Skai Jackson Are Young Fashionistas at BET Awards 2017! Yara Shahidi and Skai Jackson pose for photos while arriving at the 2017 BET Awards on Sunday (June 25) at the Microsoft Theater in Los Angeles. The young ladies showed off their fashionista sides, Yara in a denim dress and Skai in a lip-print patterned dress. Yara and Skai were joined by other young Hollywood stars like her co-star Marsai Martin, singers Justine Skye and Trevor Jackson, Stranger Things‘ Caleb McLaughlin, and sister duo Chloe & Halle. FYI: Yara is wearing a Jonathan Simkhai dress, Jimmy Choo shoes, and Jennifer Fisher jewelry. Justine is wearing a The Blonds dress. Skai is wearing a Just Cavalli dress. 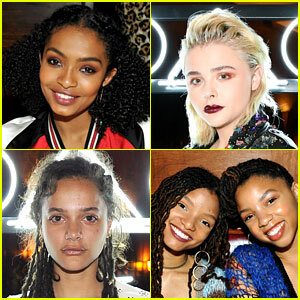 Chloe Moretz, Yara Shahidi, Sasha Lane and Chloe & Halle Bailey stepped out in style at last night’s Coach & Rodarte spring collection launch. They young stars were joined by Girl Meets World‘s Rowan Blanchard and Sabrina Carpenter (who were twinning in the most beautiful way). At one point in the private dinner at Musso & Frank Grill, in Hollywood, Yara and Rowan enganged ins some serious conversation (see all the pics in the gallery). Sasha and sister group Chloe & Halle are rising stars in young Hollywood. Chloe & Halle launched their YouTube channel when they were 13 and are now Beyonc�‘s proteges! 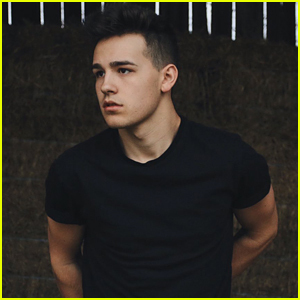 Singer Jacob Whitesides Reacts To Performing in Macy's Thanksgiving Day Parade 2016! For a lot of performers and celebs, it’s a dream to be in the Macy’s Thanksgiving Day Parade — and Jacob Whitesides just had his dream come true! Announced this morning, Jacob will be performing in the 2016 event along with Daya, Maddie and Tae, Chloe and Halle, Kelsea Ballerini, and many more. Olympic gymnast Laurie Hernandez will also make an appearance alongside former NHL players Adam Graves and Eric Lindros and U.S. Paralympic gold medalists Mikey Brannigan and Gianfranco Iannotta. “guys,, i’m performing at the MACY’S THANKSGIVING DAY parade this year!!! cannot BELIEEVE this is rlly happening. freakin dream come true,” Daya reacted on Twitter. Check out Jacob‘s reaction below! The 2016 Macy’s Thanksgiving Day Parade will air at 9AM ET during NBC’s Today show. Chloe x Halle Drop New Video For 'Fall' - Watch Now! 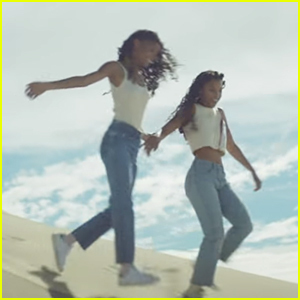 Chloe x Halle run down the side of a sand dune in their brand new video for “Fall”. The two singing sisters debuted the video this morning on the Today Show in New York City. “Everyone!!!! We r so happy to show y’all our new music video to “‘fall’,” the girls wrote on Twitter after its debut on YouTube. If you missed it, it was rumored that Chloe x Halle might have been dropping their album in September, but with only one day left in the month, we’re hoping it’s October now!